AVReturn by Date (up to 11/04/2015). Click to enlarge. Also see this spreadsheet. 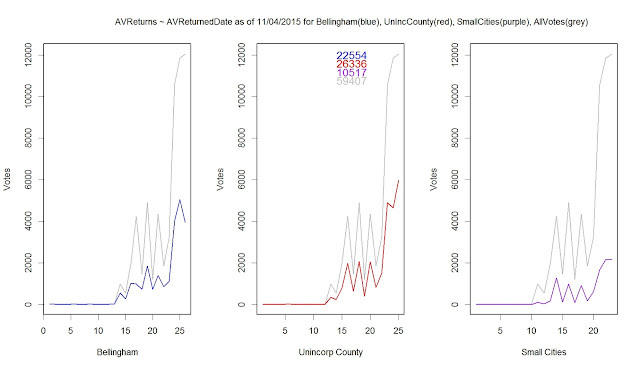 Last night matchbacks in Whatcom County counted 12,056 votes. The voter roll now stands at 130,301 registered voters. 70,006 ballots are out somewhere, either in the mail currently or not voted. There are 58,111 Good ballots, 448 Challenged Ballots, 848 Undeliverables and 888 ballots have been marked Void. You should receive notice if your ballot has been challenged. If you would like to check, go to myvote.wa.gov to see the status of your ballot. 79,108 ballots were received of all status types in 2014. Today, we are 19,698 ballots short of that figure at 59,410. Please see these spreadsheets here and here for more information. I think it is conceivable we could reach 70K total ballots (all status) on Friday. The first table below my comments is the top 25 Precincts ranked by 'Good' ballots. These top 25 precincts are currently reporting a cumulative 52% turnout as opposed to the 45% for all precincts. The second table gives those the top 25 out of 60 precincts currently reporting over 49% turnout. R 3.2 code for my GE 2015 matchbacks is here. People want to know: Will the next 10K swing right or left? How about the 10K after that? My answer is that I really don't know. Under 65K, some "small sample size" factor kicks in and I have seen elections in that range go left or right in the late ballots. Between 65K to 75K purple can become a little more bluish in Whatcom County. After 75K, the county essentially runs out of conservative votes. When President Obama's organization brought in 102K ballots in 2012, all of those young millennials, all of those disenfranchised souls, many who had never voted in the last five elections, turned out. Probably, the small cities (300 - 900 series) will start to run out of electoral steam soon. 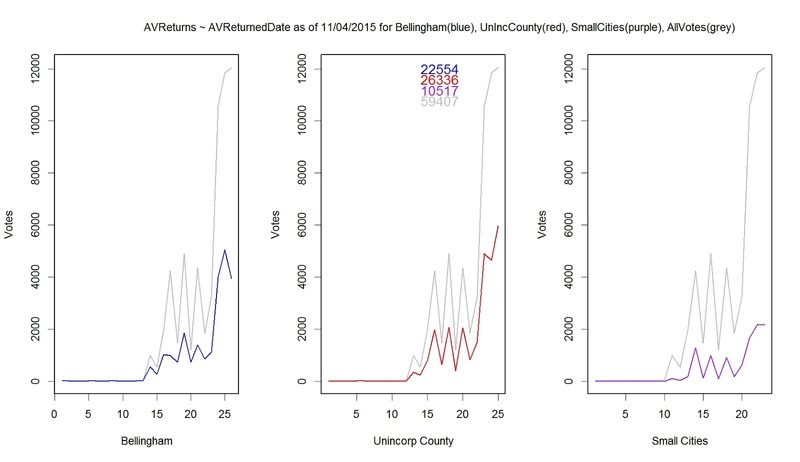 What Bellingham and the unincorporated County will do is up for grabs as is the number of ballots left in the hopper. It is 12:50 PM and the county is showing past 60K now. I haven't seen that change in an hour. Sidhu/Kershner is tight, the jail is tight. Both races could go either way. "Total Registered (Active) Voters: 130301"